The berry section of the garden is above the water hydrants inside the fence. There are already the three rows of raspberries up there that we planted this summer. 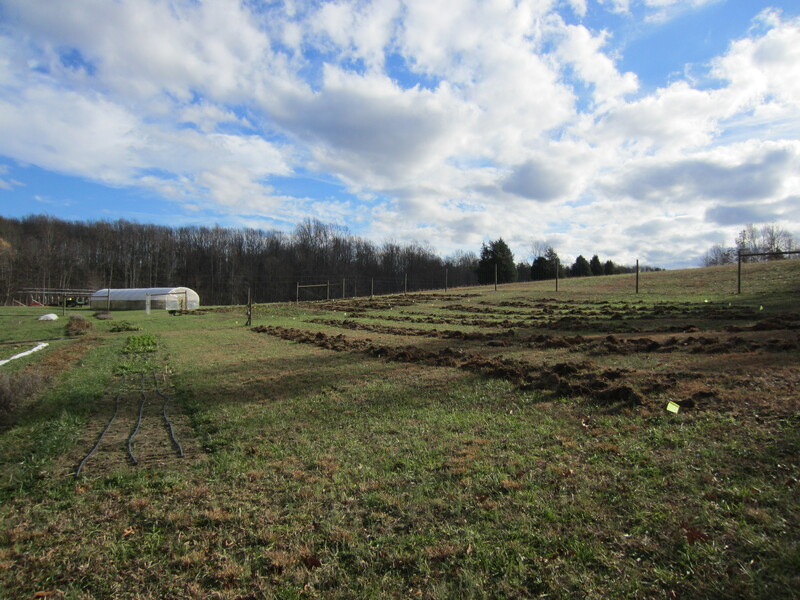 The center section will be raspberries, the eastern section will be a mix of berries and other small fruits, and the western section will be our blueberry planting area. Gavin had already laid out the entire area with flags so we could get an idea of how best to use the area. The west side of the fence is at an angle so the rows in that section are all different lengths. 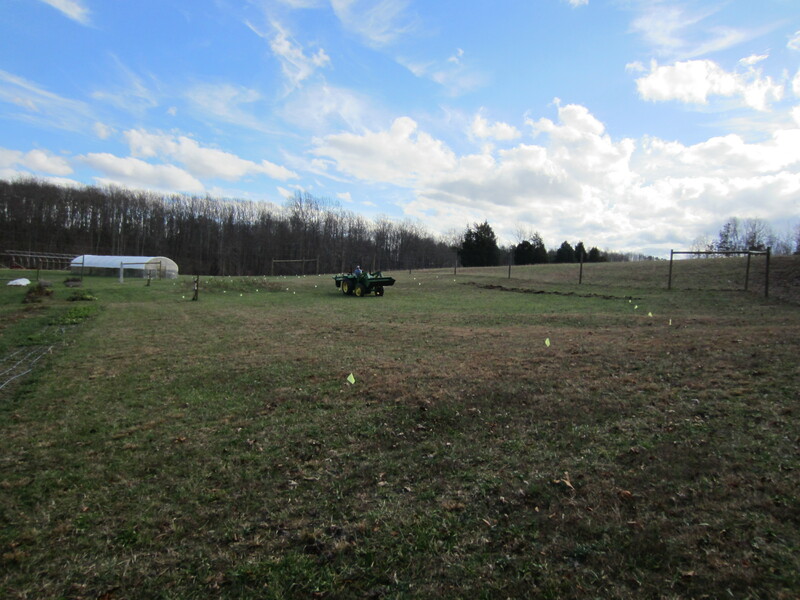 At the ends of the rows on this side we’ll put fruit trees along the fence-line. 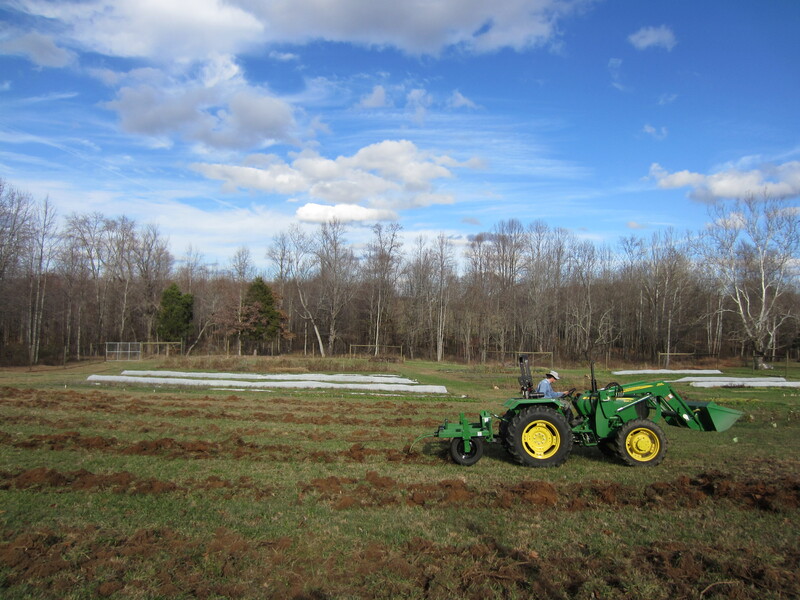 We shouldn’t need to get in here to till again after the berries are planted, but we will need to access the rows for adding compost and sawdust materials to the beds every year. 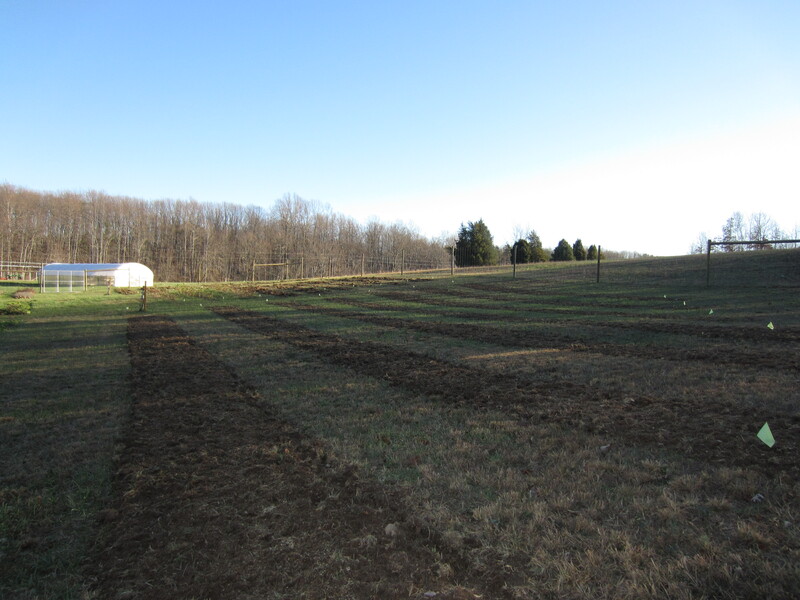 The blueberry beds are 12′ on center. There are seven rows in this section, and 9 in the other two sections (those are 8′ on center). You can kind of see the layout here and how it relates to the rest of the garden. 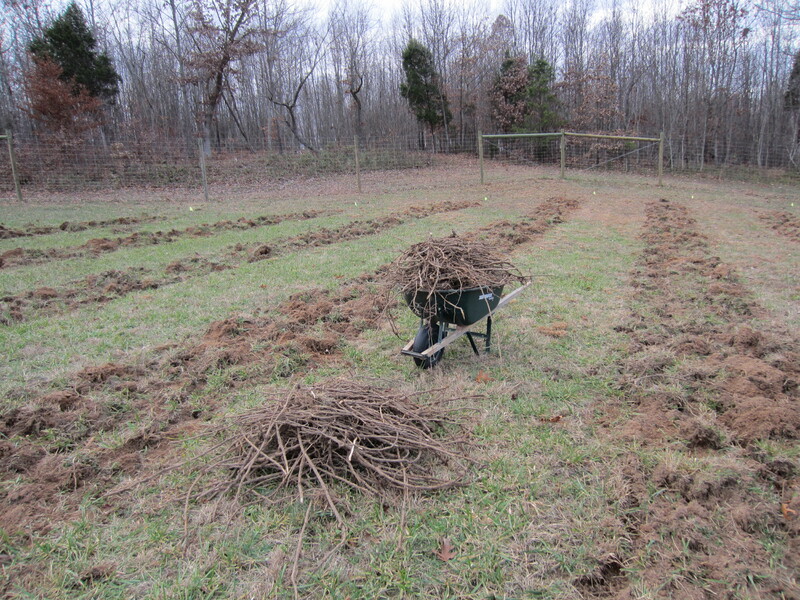 This area is filled with invasive sumac, and we pulled out piles and piles of their healthy roots. It is surprising how well they were thriving, considering we have kept this area mown for the past two years. Hence the term invasive. Next came sawdust and sulphur application. 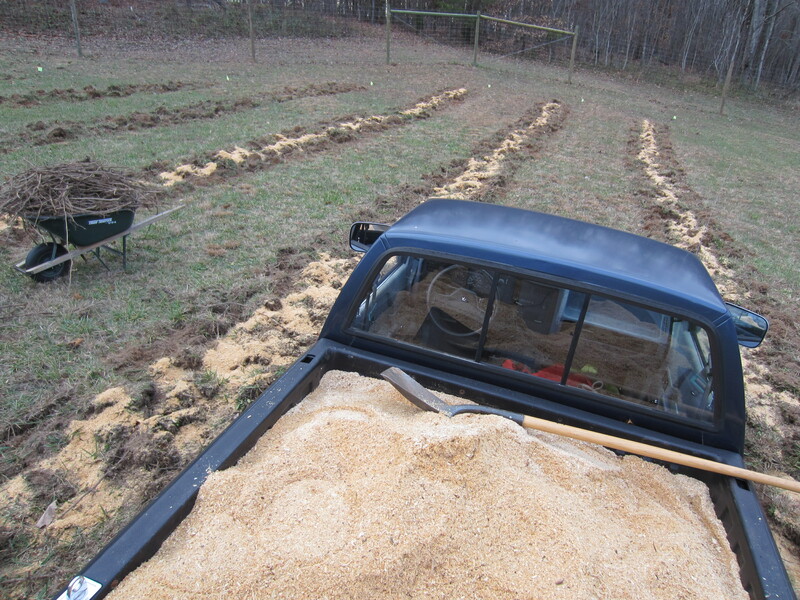 We put a whole pickup load of sawdust distributed between the rows, and forty pounds of sulphur. 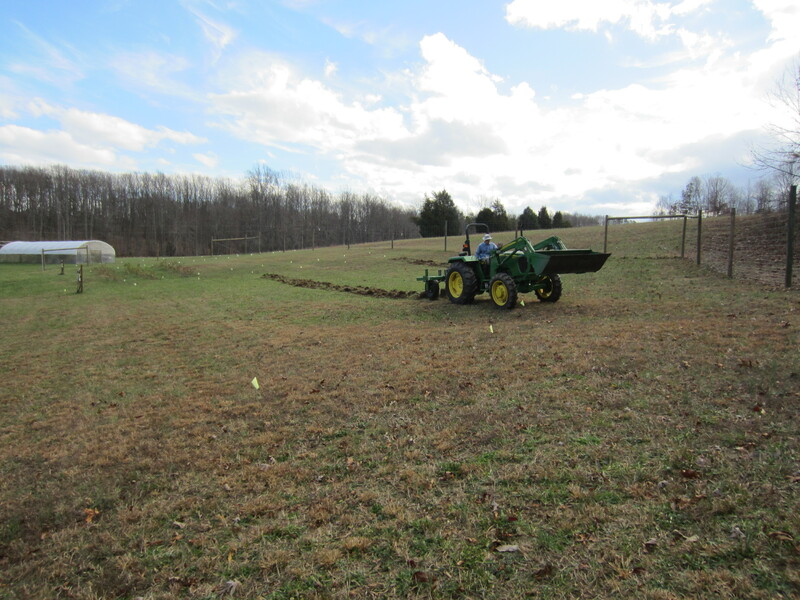 Gavin had calculated what was needed from the soil test results. 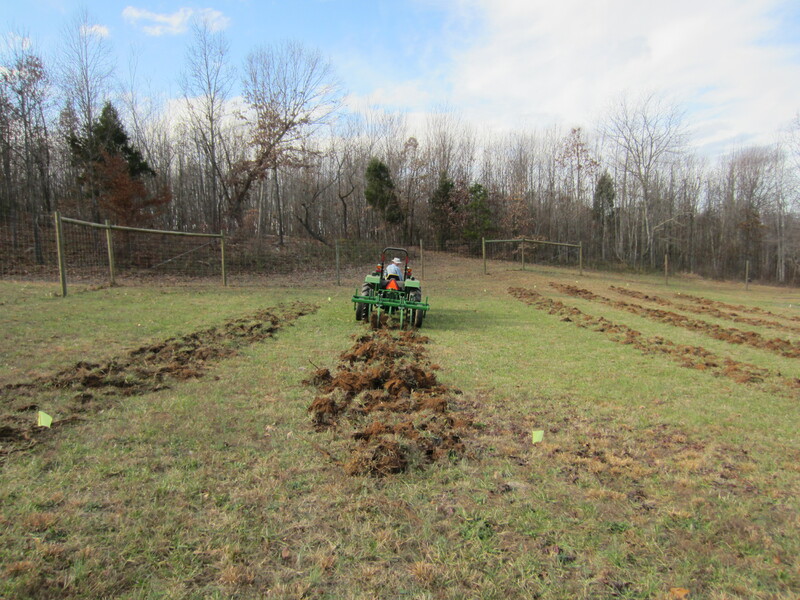 We’ll test again and amend as necessary in the spring before planting. The soil here is already slightly acid, but blueberries need a pH of 4.5 to 5, which is a little lower than what occurs naturally in this area. We do have some wild blueberries growing in several places around the property, so we are hoping the cultivated varieties will do as well as the native species. 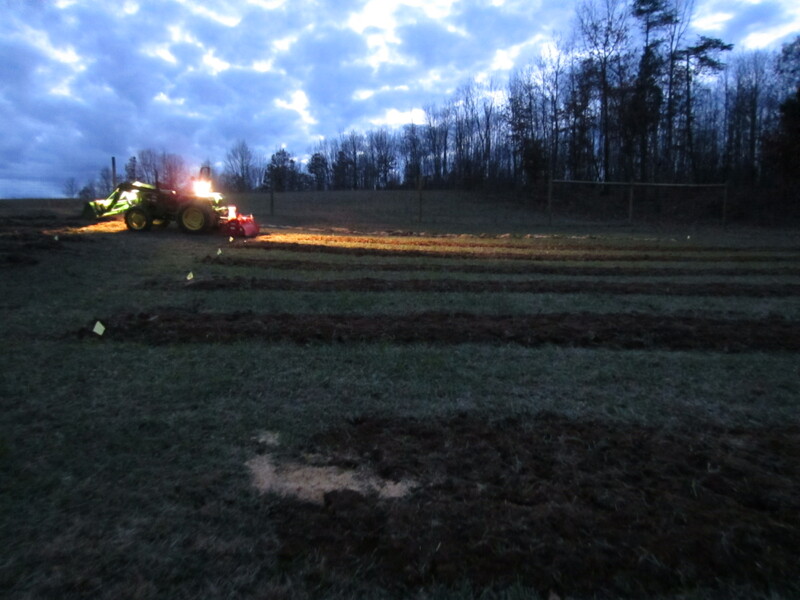 It took all afternoon to complete this task, but we were able to finish the sawdust application by dusk and Gavin ran through the beds with the tiller to incorporate the materials. So, the blueberry section is done, but we still have the other two sections to tackle. There are tons of rocks to be removed from the center section… always a fun task. We are one small step closer to having more diversity in our offerings! Of course, once planted the blueberries still will not be producing for several more years! Berries….yum! Such a lot of work to prepare! Planning for the future.